The 6-6 Hideaway with its 6 Generation IV 3-Watt LEDs is the most powerful strobe you can buy. 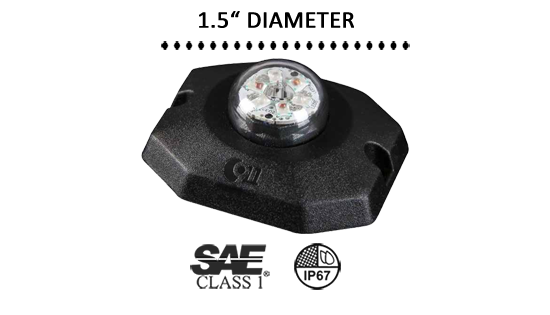 It is perfect for undercover work because it is completely concealed when installed in the head and tail lights of your surveillance vehicle. It’s only when you turn it on and blast the scene with 18 Watts of brilliant illumination that your cover is blown. Choose a surface mount frame from black or chrome to mount it anywhere on the exterior of your vehicle that is flat; it’s sealed and waterproof and comes with a rubber gasket for a tight fit. It is wired directly into an existing siren or emergency light system and can synchronize and/or alternate. The ‘6-6’ comes with a built-in circuit board flasher and 8” power cord. It has 21 pre-programed flash patterns with pattern memory, but you have the choice of color from 5 solids or 4 split-color combinations. It’s always best to use an EVT professional to install this light. Be sure to check out our Installation Guide in the Knowledge Base section of our website if you decide to do it yourself and always install the lights before doing any wiring. ETD designs high-quality, affordable lights that are tough and stand up to the task. Our LEDs are made to last 100,000 hours and work just as hard on the job as you do. Quality, Durability, and Great Prices….that’s what we’re all about at Extreme Tactical Dynamics!